Kirkjubøur is a vilage in Southern Streymoy. Bus from Torshvn Car on singed road going west from the southern part of the ring road. Walking - it's not big. Never completed Magnus cathedral - currently having its walls dried out for restoration (2008) and, being covered by a huge tarpaulin, not pretty from outside but the interior still has appeal. 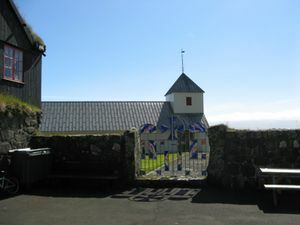 The cathedral, less roof and tower, was built when Kirkjubøur was the most important place in the islands. It's hardly surprising that it should have been overtaken bu Torshavn with its better anchorage but quite astonishing that the cathedral could ever have progressed as far as it did in this tiny community. St Olav's church, the last of several churches to occupy this site. Its gates suggest something grander within but it is very plain, though far from unpleasant. 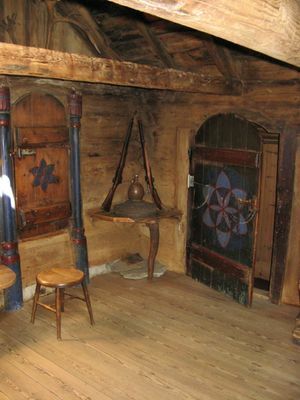 Wonderfully carved pew ends from an earlier building can now be seen in Torshavn Museum. Roykstovan a museum using part of a farmhouse, with the owners living in the other part. This page was last edited on 17 February 2010, at 23:34.